The Citadel Compact CI-C100 is encased in a rugged IP-65 housing, designed to withstand vibration in accordance with MIL-STD 810F. It is provides high-performance images, even under the harshest conditions, in temperatures ranging from -40°C to +70°C. All electrical connections go through a MIL-compliant ten-pin round connector. The integrated mounting bracket allows precise elevation and azimuth alignment of the camera. The special distortion-free wide angle lens of the Citadel Compact CI-C100 can be factory configured for a field of view (FOV) ranging from 47° – 95°, allowing easy adaptation to the various on-vehicle visualisation needs. With the high sensitivity and automatic exposure modes of the Citadel Compact CI-C100, it can operate from dawn to dusk and even produce images in full moonlit conditions. The extended night mode allows low light level operation with up to 4 seconds integration. 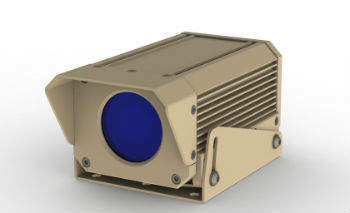 The Citadel Compact CI-C100 uses conductive cooling to remove heat from the CCD sensor. This reduces random noise in the CCD sensors, resulting in improved image quality, particularly in low-light conditions. The digital noise reduction function, based on a 2D and 3D algorithm, helps reduce noise in low-light conditions. Providing increased safety for the entire vehicle crew of armoured vehicles is of prime importance in the battlefield. Mounting several wide angle cameras on strategic positions on the vehicle provides an unobstructed view over the near surroundings, with all hatches closed.